The only known original example of this exceptional Civil War Recruitment Poster for the 56th Pennsylvania Regiment. This is an extremely rare original American Civil War recruiting broadsheet issued in 1861 by Captain A. W. Richards to recruit Union Army soldiers in Philadelphia. 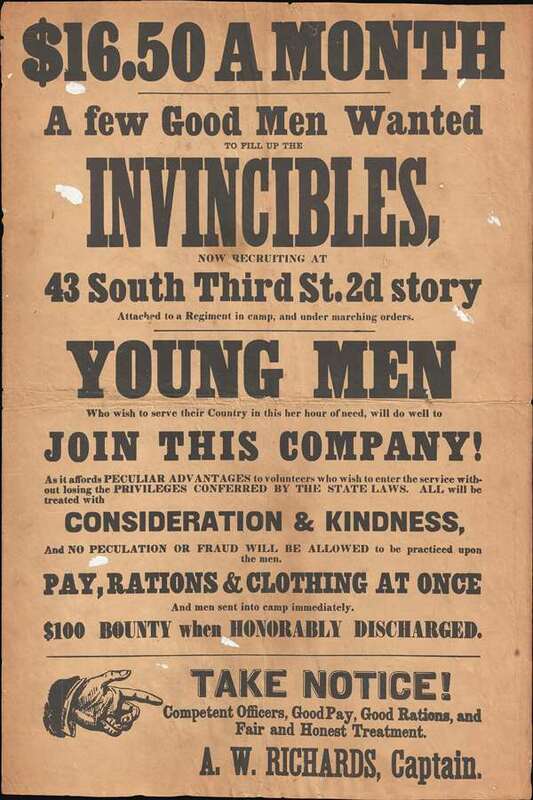 The poster advertises for men to join 'The Invincibles,' offering $16.50 a month and a $100 discharge bonus, as well as 'Competent Officers, Good Pay, Good Rations, and Fair and Honest Treatment.' This broadsheet is most likely associated with the mustering of the 56th Pennsylvania Volunteer Infantry, which took place under Colonel Sullivan A. Meredith in fall of 1861. The Civil War (1861 – 1865) was one of America's bloodiest conflicts with nearly 620,000 Union and Confederate soldiers lost. After the bloody opening salvos of the war both sides soon found themselves in need of more men to fill out old regiments and build new ones. The recruitment drive for Union forces was particularly aggressive New York, Pennsylvania, and New Jersey. Recruiters would offer potential soldiers generous signing bonuses and pay. That the present broadsheet advertises only a $100 signing bonus is indicative of the early stage of the war in 1861. Later in the war, when new soldiers became more difficult to muster, these bonuses rose to hundreds of dollars. Today, Civil War recruitment broadsheets are rare on the private market despite being well represented in a couple of major historical archives. An advertisement in the October 14, 1861 issue of the Philadelphia Public Ledger, referring to this recruitment effort naming both Richards and the signup location, (43 South Third Street, 2d Story) helps to date this broadsheet with some precision. Unfortunately, a great deal of ambiguity remains regarding just who Richards and the 'Invincibles' were. There is one other known broadsheet recruitment poster associated with A. W. Richards and the 'Invincibles' located in the Rare Books and Special Collections Library at Princeton University. This undated broadside states that the 'Invincibles' were attached to Col. Sullivan Amory Meredith's Regiment. From April of 1861, Meredith was in charge of the 10th Pennsylvania Volunteer Regiment, a 3-month service regiment that mustered out of service in July of 1861. He immediately set to build a second regiment, the 56th Pennsylvania Volunteer Infantry. There can be little doubt that this broadside was issued for this recruitment effort. The new regiment mustered in on October 16, 1861. Under the command of Col. Sullivan Amory Meredith, the 56th regiment mustered in on October 16, 1861. It proved to be one of the longest serving and most influential regiments in the American Civil War, only being mustered out of service at the end of the war in 1865. It saw action at the Second Battle of Bull Run, the Battle of South Mountain, and the Battle of Antietam, the Battle of Fredericksburg, the Battle of Chancellorsville, the Battle of Gettysburg, and oversaw Lee's surrender at the Appomattox Court House, among many others. Who was A. W. Richards? As regards A. W. Richards, there appears to be no clear information. His name does not appear in the Civil War database maintained by the National Park Service. Nor does he appear on any of the official the rosters of the 56th Pennsylvania Regiment. It is possible that Richards was simply a recruitment officer hired by Meredith whose rank, Captain, was merely a fiction. Based upon the style, date, associated records it is likely that they broadsheet was issued by the U.S. Steam Print Company located at the Ledger Building in Philadelphia. There is an example of this in the Lincoln Broadsides collection at Brown University, but a close examination of the Brown copy indicates that it is a reproduction issued by the Chicago Historical Society in 1965, as there is a printed Chicago Historical Society imprint in the lower right corner. We have been able to compare the paper and believe that our example to be the authentic poster, as the paper on our example is thin, acidic, and consistent with other Civil War recruitment broadsides and the Brown reproduction is on thicker paper of much higher quality. Moreover, there are also modern reproductions that have been issued recently from the Brown image, sometimes on parchment or other paper. As for the Chicago Historical Society, although they clearly issued a reprint in 1865, there is no record of a similar piece in the Chicago Historical Collection or its host institution, the Newberry Library, making this the only known example. Good. Even overall toning. Some paint spots (white) on recto. Some wear on old fold line. OCLC 537729345. Lincoln Broadsides, Brown Digital Repository, Brown University Library.